My friend at work lost her Nan the other day. She was 92 and she was a firecracker! My friend helped her with her last wishes and enabled her to stay in her condo to her final day. I wanted to make her a special sympathy card. I have to admit that sympathy cards aren’t easy to make but this one just came to me. My friend would talk about taking her Nan out for tea and what a wonderful time they had. 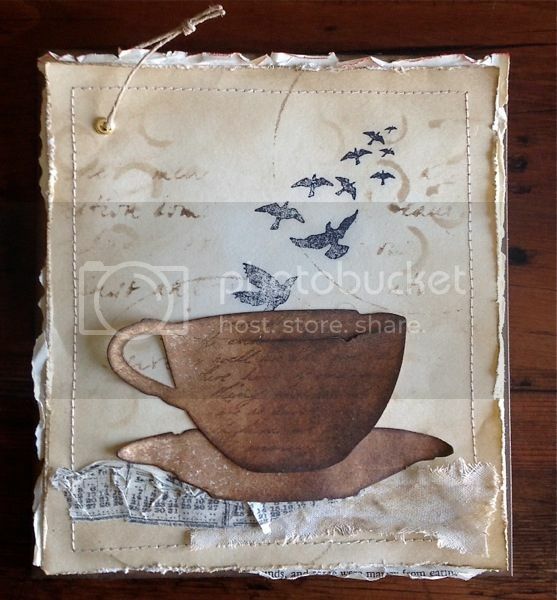 I thought Tim Holtz tea cup die would be perfect to feature on her card. I used lots of distress ink and stencils on the card. The bird stamp was just perfect for this card. See the inked rings? I inked the edge of a Tim Hortons coffee mug and stamped it right on to the card. -great idea huh? The tea cup started as cream colour card stock if you can believe it or not. I sprayed it with Lindy’s moon shadow mist in burnt umbre. I stamped it with a cursive stamp and then inked it with Prima’s chalk ink in knotted wood. I gathered tissue tape and applied it over a distressed piece of antique seam binding that had been distressed. I added the eyelet and twine for some interest. I layered it over a book page prior to attaching it to an inked kraft card base. I die cut “love forever” from Tim Holtz’ new sentiments dies and attached them to the inside of the card. I hope my friend knows that this card comes from my heart and that it brings her a little love and comfort.